1 Rool , 1"x 50 yds. SAVE OVER 50% ON PAINTING TOOLS ! This masking tape is another consumer favorite because it delivers sharp paint lines and removes cleanly without surface damage. Strong, professional grade painter’s masking tape provides less edge bleed and works great for exterior and interior use. Painter’s Masking tape is pressure-sensitive adhesive allows it to remove clean when you’re done! 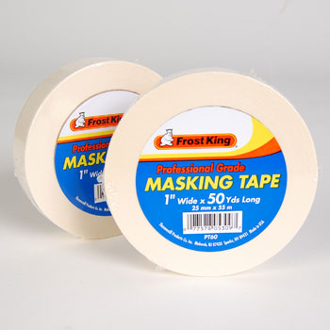 This masking tape removes cleanly without adhesive transfer or surface damage for up to 7 days, even in direct sunlight. It is a medium adhesion masking tape that is ideal for painted walls and trim, woodwork, glass and metal.